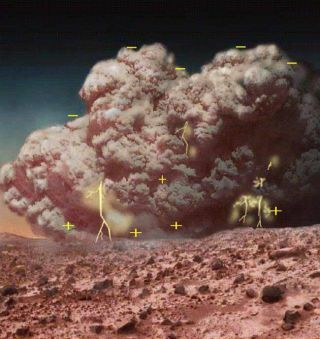 This is an artist's concept of an electrically-charged dust storm on Mars. The "+" and "-" symbols represent positive and negative electric charges, respectively. Dust stormsraging across the surface of Mars maywield toxic chemicals that could poison any forms of life as we know it on theplanet's surface, according to two NASA-sponsored studies. Small dustdevils and planet-widestorms - combined with static electricity - may lead to the formation ofhydrogen peroxide and other corrosive chemicals that fall to the Martiansurface as a sort of toxic snow, the reports stated. "We aretrying to look at the features that make a planet habitable or uninhabitable,whether for life that developed there or life that we bring there," said onestudy's lead author Gregory Delory, a University of California, Berkeleyphysicist, in a statement. Delory andhis colleagues found that Martian dust storms, like their Earthly counterparts,can generate electricfields that rip apart water and carbon dioxide molecules in the planet'sthin atmosphere. Those molecules would then be free to form hydrogen peroxideand other toxic oxidants that could scour the Martian surface of any organicmolecules crucial for the formation of life. A secondstudy, led by University of Michigan researcher Sushil Atreya, found that thelevels of hydrogen peroxide that could coalesce from Martian dust storms would be high enough to condense into snow that could blanket the surface below. "As aconsequence, any nascent life (microorganisms, for example) or even prebioticmolecules, would find [it] hard to get a foothold on the surface of Mars, asthe organic material would have been scavenged by the surface oxidants," said Atreya,a professor with the university's Department of Atmospheric, Oceanic and SpaceSciences, in a statement. Both studies- which drew on Earth dust storm observations, computer models and labexperiments - appeared in a recent issue of the journal Astrobiology.They were conducted for NASA's Goddard Space Flight Center and the agency'sMars Fundamental Research Program. Planetaryscientists have long known that Mars'surface presents a hostile environment for life to take root, thoughobservations by NASA's hardy Spiritand Opportunity rovers and other probes still exploring the red planet todayhave found signs that wateronce wet the surface long ago. Some spacecraft - including Europe's MarsExpress and NASA's recently arrived MarsReconnaissance Orbiter - are using radar to probe beneaththe planet's surface for caches of liquid or ice water, which scientistsbelieve is an essentialingredient for the formation of life. Meanwhile, thestudies led by Delory and Atreya may help answer one long-lasting riddle ofMars exploration. NASA's twoViking landers found conflictingresults when they tested Martian soil for signs of life in the mid-1970s. Thelanders added water and nutrients to Martian dirt to see if it contained anymicroorganisms. One instrument watched the nutrients as something broke themdown, but another recorded no signs of organic matter in the Martian material. Thepresence of hydrogen peroxide or ozone in the Mars dirt could have fooled theViking instruments by producing reactions similar to that expected frommicroorganisms, researchers said, adding that the substance could also breakdown methaneseen in the Martian atmosphere. "Thepresence of peroxide may explain the quandary we have had with Mars, but thereis still a lot we don't understand about the chemistry of the atmosphere andthe soils of the planet," Delory said.